All Photos by Dee Ritter unless noted. The Barber Vintage Festival is quite an event, with something for just about everyone. It’s on the AHRMA race schedule so there’s vintage racing. Motorcycle Classics magazine always hosts a vintage bike contest with Italian, British, and European categories. It’s in the area called The Fan Zone, where there are lots of vendor tents and the “wall of death” shows. The Japanese Vintage Owners Club has a separate bike judging. There’s a big swap meet. The Ace Café is new this year (more about this later). And, of course, there’s the Barber Motorcycle Museum, worlds largest, with bikes from all eras in three stories. They were just finishing up a large expansion so there will be even more bikes to look at next year. The festival is always held in October and if you like motorcycles I recommend that you attend at least once. As I’ve mentioned before, Dee claims when traveling she is the master of non-tragic disasters. Our trip to Birmingham was no exception, as you shall see. This was the third trip to the Barber Vintage Festival for Dee, Russ and me. We left on Thursday, flying from Portland to Birmingham with a 2-hour layover and plane switch at Houston. In Houston I was taken to the jet way where my wheelchair was waiting, and surprise! the left tire was flat. The South West Airlines ground crew had an air hose but the tube refused to hold air even for a minute. I always travel with a spare inner tube and, under my supervision, the ground crew changed the tube and pumped up the tire. Non-tragic disaster number one. In the meantime I’m transferred from the very uncomfortable aisle chair to a slightly less uncomfortable airport chair, where I can at least sit on my own chair’s cushion. Airport chairs are one-size-fits-all, so they are very wide. I have to spread my legs to get my feet on the foot rests. We nicknamed it the “gyno-chair.” By the time we get my chair working it’s getting close to the pre-boarding for the next flight so we use my chair as a luggage cart and I get pushed around in the gyno-chair. The second leg into Birmingham went fine. At the airport we meet the van rental guy and he shows us how to manually lower and close the ramp. It’s not powered? No, sorry says the driver. The ramp is well damped so it won’t slam open, but it’s really heavy. Lowering it is not bad but at one point during the weekend Russ wasn’t available and Dee had to ask a passing stranger for help. She couldn’t lift it on her own. On the plane from Houston to Birmingham Russ started talking to a guy in the row behind him about the festival. It turned out he was somehow involved in Friday afternoon/evening Ace Café party. This is normally an extra ticket item but the guy liked Russ so he put us “on the list” and we got in no charge. The Ace Café is a new thing for the track, near turn 7. There were vendor tents along two sides of a rectangle, and a stage on the third side. The fourth side is open so bikes can come and go from the area in the middle. There was a band on a stage playing country rock, and beer and wine were available. In fact it’s the only place on track where you can get alcohol. It was a real party atmosphere. The 238,000 mile Ducati Monster. The nice RD400 behind had just over 10,000 miles. Parked in the enclosure was a new-looking Yamaha RD400. Next to that was a well-used looking Ducati 900 Monster, an early one. Dee went to look at the RD and ran into the Ducati’s owner. He told her it had over 238,000 miles on it. He said he has done all the standard maintenance on schedule, like changing the oil, changing the cam drive belts, checking the valves, etc. The motor just won’t quit, he said. Dee tests the 238,000 mile Monster. The owner adds encouragement. Photo by Russ Granger. The bike shows its age. The tank is dented, the seams on the saddle are coming apart, the cowling around the speedometer is bent, the ball on the clutch lever is missing. It is a well used motorcycle and looks it. It’s licensed in New Hampshire so he must ride a lot during their short riding season. Sorry I can’t remember his name. Saturday I wanted to see the new Vee Two bevel-drive Ducati so we went to the Fan Zone. It was on display where the classic and vintage motorcycle show bikes were parked. When we got there the Vee Two bike was on the race track, doing some demo laps ridden by Alan Cathcart. We waited, watched the racing that followed Cathcart’s test ride, and checked out the vendor tents. I talked to Alan after he came in. “How was it?” I asked. “Very good. I think they’re really onto something here,” was his reply. It’s pretty interesting. It uses a modified Ducati SS frame (it even has the Ducati serial number on it) but the forks and shocks are Ohlins. The crankcases, cylinders and heads are all sand-cast; I could see the graininess in the castings. There’s more on this particular item later. Saturday night there was a Ducati dinner and then a walk to the Hilton for the “Fly on the Wall” event. Vicki Smith organizes this each year — Cook Neilson called it a place where “a handful of old guys sit at a big table and tell lies” while others listen. This year the old guys included Cook, winner of the 1977 Daytona Superbike race and former editor of Cycle magazine; Brian Slark, a former Norton importer and current curator of the Barber Motorcycle Museum; Peter Egan, a semi-retired columnist (the Leanings articles) for Cycle World magazine and the author of several books; Leo Goff, a big guy who is an engine builder/restorer who’s been around for a long time, now working out of Memphis; and me. From left to right, Leo Goff, Peter Egan, Brian Slark, and Cook Neilson. I’m on the left end of the table. You can see my legs and part of the wheelchair beneath the table. Behind Peter Egan is Vicki Smith, who organized it all. The conversation wandered around a lot. We talked about Jerry Branch and C.R. Axtell and their rivalry, Cycle magazine’s first super bike comparison test and how the Harley guys were caught cheating (and Cycle told everyone). We talked about ways to make MotoAmerica succeed. Somebody told a story about a baby alligator that had Cook cracking up. I wish I took notes because I can’t remember the details of the story — somebody reached into a box without looking and the little gator clamped on to his finger. Peter Egan was asked about the origins of the Slimy Crud Motorcycle Club. He insisted it was the Slimy Crud Motorcycle Gang, not club. He told a funny story about how the SCMG started and developed. There’s your answer, from the expert. As the event started to break up I asked Peter Egan about riding roads in Wisconsin. During the conversation he noticed my book and asked about it. He bought one! In a later email he told me he’s enjoying it. It’s pretty cool to have a writer with the skills of Mr. Egan saying he likes my book. Sunday was a lost day. Some medical problems kept Dee and me at the hotel for so long there really wasn’t time for us to go to the track. Non tragic disaster number two. It seems that as I age, travel becomes more and more difficult. Russ went to the track to visit with some of his AHRMA pals and help them load up their bikes and gear. The Vintage Festival was over Sunday but we stayed an extra day so we could spend some hours at the Museum. Our long-time friend Catfish was touring the same day so we wandered around together. 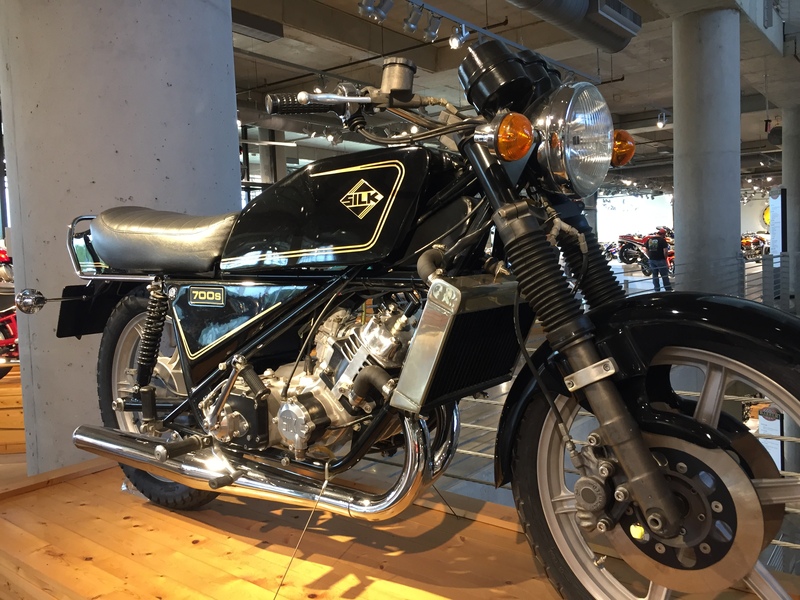 It’s an amazing place, with old motorcycles, new motorcycles, rare motorcycles, everyday motorcycles, Motorcycles on the floor, hanging from the ceiling, in racks one over the other like bookshelves. It’s hard to get a photo that shows the vastness of the building, so instead here’s a photo of a rare bike, the 1979 Silk. According to the info sheet it was built in Great Britain, a 653cc parallel twin, water cooled two-stroke. The motor was based on the design of the British Scott motorcycle of 1909 but with modern materials housed in an modified Spondon chassis designed for a 250cc motor. The result was a street-legal machine weighing 310 lbs with a top speed of 110 mph. On paper it sounds like a winner but the firm could build only 10 bikes per week so it was not viable. A total of 138 were built between 1975-1979, according to the spec sheet. Our visit was interrupted by the unexpected arrival of the Vee Two people and their bike, the VeeTwo Imola Evo. You can read about it from their website, http://www.veetwo.com/home.html, but it was fun to get the information directly from the principles, Andrew Cathcart (Alan Cathcart’s son) and Brook Henry. The company is in Nannup, West Australia, so the trip to Birmingham was a major effort. Alan Cathcart, Andrew Cathcart, and myself. In back Russ Granger (in cap) chats with Btook Henry. About the bike. I already mentioned that it had all sandcast cases, cylinders and heads, and it uses the stock Ducati bevel SS frame. The motor is based on the NCR motor, which in turn is a variant of the original 1972 Ducati V-twin bevel drive motor. There are some obvious visual differences from the standard Ducati 900SS bevel, such as a dry clutch, a spin-on oil filter, external oil cooler and all the oil lines for it, magnesium for the cam box and bevel gear covers, and Olins suspension front and rear, with radial mount Brembo brake calipers, and a two-into-one exhaust that snakes around through the frame. What I didn’t know was that in recasting the motor the VeeTwo people had changed the three engine mounting points to rotate the motor backwards. As I recall Andrew told me it was 10 degrees but I may be remembering that wrong. The cylinders have Nikasil coated bores instead of iron liner inserts. The cylinder heads have an included valve angle of 56 degrees for improved combustion chamber shape. The original bevel motor had valves at 80 degrees while the later bevel endurance racers and the belt-drive Pantah motors had narrowed that to 60 degrees. The Imola Evo has a high-pressure oil pump and plain main bearings, fixing the older design’s weak point – the caged roller main bearings that were fine for street use but failed too frequently under racing conditions. Other moving internals have been lightened using modern techniques and materials – crankshaft, connecting rods, pistons, valves, and camshaft pieces. It still has Desmo valve actuation, of course. After the Vee Two episode we wandered around the museum until they chased us out. We were supposed to fly out of Birmingham on Tuesday at 11:45, switch planes in Las Vegas after a 90 minute layover, arriving in Portland at 5:40. We should have been home in Albany around 8:00 pm. We get to the airport on time and gave the wheelchair van back. There are two guys there and the younger one pushes a button somewhere and the ramp lifts on its own! It was powered all along. The original driver was all apologetic. For 4 days we had been pushing that heavy ramp up and down when we didn’t need to. Non-tragic disaster number three. Note those keywords “suppose to” and “should,” above. The plane was late. Really late. Some kind of mechanical problem. At the original departure time I asked the gate agent where the plane was. “Still on the ground in Orlando,” she said. The agents got very busy finding new flights for everyone who was going to miss a connecting flight in LV. We were rescheduled for the Las Vegas to Portland leg on a flight leaving Vegas at 8:30 and arriving at PDX about 10:40. With the normal delays from me being in a wheelchair we would get home around 1:00 am. Non-tragic disaster number four. We finally departed Birmingham around 2:30, getting into Vegas about 4:30. There are worse places to have a 4 hour layover than the Las Vegas airport. Russ found a table in a pub where he could plug in his computer and started working using the free airport wifi. Dee and I went for the video poker/blackjack machines. A few hours of entertainment for a few bucks. Cheaper than the movies. When we arrived in Portland around 8:30 my wheelchair had a flat tire! This time it’s the right side. This is bad because I had already used my spare tube. Sigh. I have a small hand pump in my tool kit and we found that the tire can be pumped up enough for me to move around for about 30 minutes. I wouldn’t call it a slow leak, more like a not-very-fast leak. In any case we stopped every 30 – 60 minutes and Russ pumped the tire up and I tried not to move around too much. Non-tragic disaster number five. We have to go to the South West Airlines office to claim damages. The man in charge is very apologetic and keeps saying he’ll make it right. I bring up the site where I get my inner tubes on my phone and he writes it down. I’m still waiting for the replacement tube. With all the delay in reporting the damage we got home around 3:00 am, completely exhausted physically and mentally. That was the Barber Vintage Festival 2016. It’s really a lot of fun, lots of different things going on, and you never know who you’re going to meet. I highly recommend it. Next time we’ll take more tubes.